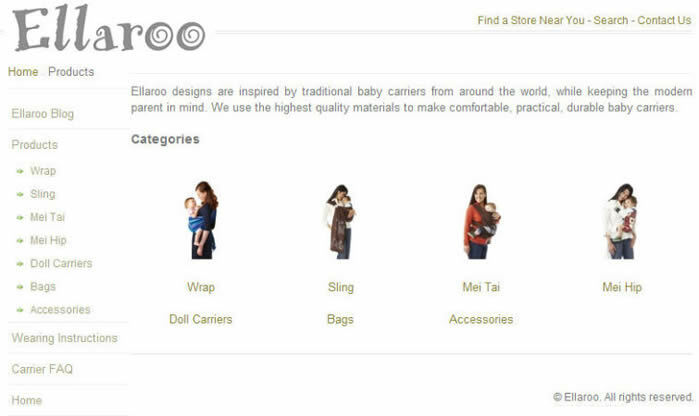 Ellaroo is a specialised in e-commerce (selling via internet) of baby carriers and related articles. Ellaroo designs are inspired by traditional baby carriers from around the world, while keeping the modern parent in mind. His brother Miguel Garcia-Bosschaerts takes care of the e-commerce of babyslings in Europe via www.patapum.com and www.pepperminteu.com. Vesta & Jan formerly owned www.peppermint.com (also e-commerce of baby carriers), but they have sold this company. Ellaroo does not sell their products direct to consumers. To find out where to buy, please visit this link. The Ellaroo Ring Sling is a simple all-around sling, with just a touch of padding in the shoulder and rails. It is the perfect foundation piece for a well-rounded sling collection. The inner and outer rails are fully independently adjustable through lightweight brushed aluminum sling rings, with an open tail for maximum adjustability and versatility. The sling is designed to slightly cup the shoulder and spread naturally over the back, keeping baby secure and close to your center of gravity. It's great for newborns, nursing moms, and it carries heavy toddlers exceptionally well. The Ellaroo Wrap has that just-right stretch, to form around you and baby, without being bouncy. The simplicity of design make this the most versatile baby carrier you can find. They are woven for Ellaroo by a cooperative of weavers in Guatemala. The Ellaroo Wrap is lightweight and easy to manipulate, compared to thicker wraparound baby carriers. For parents in warm climates, this means the Wrap is cool and breathable. For parents in cold climates, this means that it can be used under a winter jacket without making you feel (and look) like a polar bear. You can carry your child from birth through the toddler years, on the front or back. The Ellaroo Mei Tai is a versatile, sturdy, all-around baby carrier that can be worn on front and back. Because the shoulder and waist straps are tied on however you like, the pack can be easily shared between parents of very different sizes. All color choices are reversible to a solid color. This supportive carrier can be used from birth through toddler, with long-wearing comfort. The Ellaroo Mei Hip™ Baby Carrier features a shoulder strap that cups the shoulder, rather than riding up toward the wearer's neck. Add the supportive waist strap, and you have a very practical, comfortable baby carrier. This carrier allows even those with neck and back problems to wear their babies and toddlers comfortably on the hip. For use from head control through toddler. 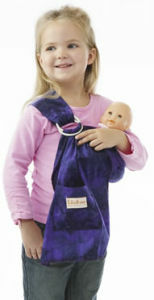 Ellaroo Doll Carriers are perfect for children who want to carry their dolls just like they were carried. Not just for fun, these miniature carriers can also help prepare children for the arrival of a new sibling. Great for dress-up play and teaching children about in-arms parenting. What was the inspiration behind creating your company: "Ellaroo" and how did you come up with the name? 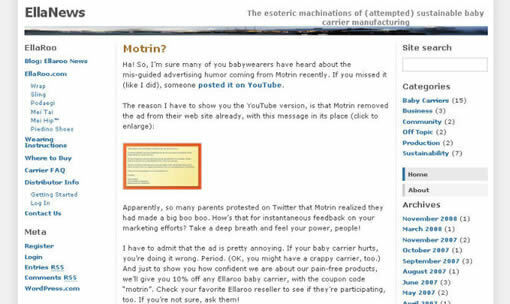 Ellaroo was created in response to my needs as a retailer, when I owned Peppermint.com (one of the first retailers to focus solely on babywearing). I was having trouble sourcing high quality baby carriers in the styles that my customers were asking for. So I made them! We have since sold Peppermint.com, in order to focus on manufacturing. As for the name, our daughter's name is Ella and we combined that with Roo, as in kangaroo. Can you tell us about the owners of Ellaroo? Ellaroo is a privately-held family business, owned by Vesta Hartman Garcia and Jan Garcia Bosschaerts. Jan's background is in business and law, in his previous life in Mexico. Vesta's background, strangely enough, is in neurobiology. But with the experienced gained retailing and personally using baby carriers, Jan and Vesta have found a very comfortable business niche. What does Ellaroo think are the main benefits of "Wearing your Baby"? Bonding - parents and newborns, adoptive parents and new babies, working parents at the end of the day, grandparents and little ones. Comfort - settling babies to sleep, comforting sick children, grounding babies in hectic public settings, nursing babies when and where they need it most. Convenience - pop baby in a carrier and do what you need to do, have no fear of stairs or subways, baby can participate in activities at adult eye level, who needs a stroller? Ergonomics (with well-designed carriers) - keep baby close to your center of gravity, there are designs for people with neck/shoulder/back problems, baby buckets are terrible for the parent's back. What do you attribute the success of your company to? 1. Ellaroo is a company committed to sustainability, from the fabrics we use to our business practices. I think that people appreciate supporting businesses that care what happens upstream and downstream from the point of sale. Consumers can make a difference in their purchasing decisions, but businesses have a chance to make an even greater impact because of the scale of our spending power. 2. Ellaroo focuses fully on the success of our customers, our retailers. We do everything we can to support them in serving their customers, from making 100% guaranteed quality products to not competing with them in the retail marketplace (we don't sell direct to consumers). 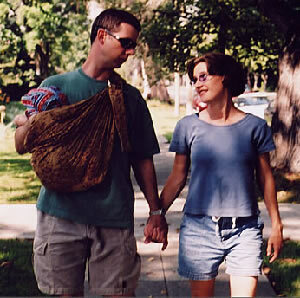 Babywearing is like breastfeeding: you're most successful when you have a support network. Our retailers are our support network. We have elected to feature Ellaroo products first, as we believe that they offer "the full package". They offer a wide range of products and have committed to being eco-friendly. They do everything possible to reduce waste and recycle in their daily procedures and manufacturing processes; looking for the shortest supply chains in sourcing materials and labor. Ellaroo uses sustainable materials whenever possible as they believe that it is better for baby and better for the environment. We applaud Ellaroo for offering a full line made from organic cotton fabrics and for using low impact fiber reactive dyes. The professionalism, ethics and integrity of this company is reflected in each of their high quality products. They unconditionally guarantee their products for workmanship and quality. Visit this link for frequently asked questions about Choosing and Using an Ellaroo Carrier. Ellaroo has it's own blog which features very interesting posts and the latest Ellaroo news. The blog can be accessed through this link. Owners: Jan Garcia-Bosschaerts & Vesta Fink-Hartman.